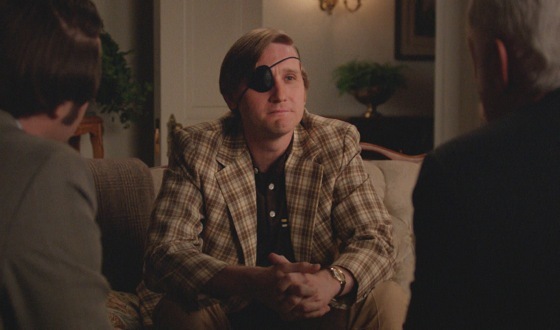 Aaron Staton, who plays Ken Cosgrove on AMC’s Mad Men, talks about his infamous tap dancing scene and keeping his eyepatch after filming. Q: You’ve been with Mad Men since Season 1. What’s the most surprising thing you’ve discovered about your character over the seven seasons? A: That’s an interesting question because it’s been a decade. Everything’s been surprising for all these characters. If you look back over the decade, they’ve lived these lives and they’ve changed with circumstances and choices they’ve made. The surprising things have been life’s turn, for Ken. He’s a very different person now than he was when he started. He ended up this family man with one eye and started out sort of like a frat guy who gave the secretaries a hard time. Q: Did you get used to the eyepatch while filming? Did you get to keep it as a souvenir? A: I did keep it! I did not get used to it. [Laughs] Fortunately, I could take it off in-between takes. Q: You’ve spoken quite a bit about your now-famous tap dancing scene. Is there any question you’re hoping someone would ask about that? What was the funniest reaction someone had to that scene? A: The response to it was really funny and unexpected. The internet has changed the water cooler moment and turned them into this “day after” meme situation. People were sending me clips of it spliced with different songs. I took a few tap classes and I did some dancing in college, but it had certainly been a while. I had fun dusting off the tap shoes. Q: You’ve said you owned one suit before Mad Men. Have any more now? Ever ask Janie Bryant for real life fashion advice? Q: Let’s talk about Episode 708 when Ken is fired. Were you surprised by his reaction? Were you hoping he would pursue his writing, or were you happy that he got hired by Dow? Q: As a working father, do you have any advice for Ken in terms of work-life balance? A: You know…he started off on the right track. He threw ambition on the scale and became more important along the line and got caught up in it. I think Ken is really an artist and his principles are strong. I feel like he’s the kind of guy that will land on his feet. He has a good marriage and I think, ultimately, he will find happiness. Q: You originally read for the part of Pete. In hindsight, are you happy you ended up with Ken instead? A: Absolutely. I can’t imagine the show any other way than the way that it is. From day one, it’s made sense. You look around and these are the people. Matt Weiner is very good at casting. You walk in and people aren’t like their characters, but there’s this essence there and it’s like the plant on the surface is different, but the roots underneath are something similar. I don’t know what it is that he senses, but there’s some essence there. Q: If you had played Pete, do you think you could have gotten through his infamous fall down the stairs scene as well as you got through your tap dancing scene? A: Absolutely not! That was comedic gold. There’s no one [else] I can think of – maybe Chevy Chase. I loved every minute of being there and watching [Vincent]. Matt Weiner did it as well and he was quite fun demonstrating. Q: What’s been your favorite Ken moment so far? A: This is a hard question! I don’t know! Playing Ken, reading the scripts, being on the set – it’s all such a big experience. There’s the scene, there’s reading the scene, there’s the table read, there’s shooting the scene. The whole experience was just so fulfilling. With Episode 306, “Guy Walks Into an Advertising Agency,” when Guy gets his foot cut off, we had tractor rehearsals. I mean, who has tractor rehearsals?! There was that, there was the anticipation, there was seeing the cannon full of blood that they were going to squirt out. [Laughs] All of these things…I will truly cherish the experience as a whole.